We don't have *actual* medals like these to hand out, but we do want to recognize the extraordinary accomplishments of local advocacy heroes. Image from olympic.org. Are you as dazzled as I am by the strength and talent of the athletes competing in Rio? And what about their moving stories? Simone Biles, Simone Manuel, Yusra Mardini are just a few who have inspired me. Closer to home, I’ve been just as impressed by community members flexing their advocacy muscles and achieving victories in the movement to ensure that everyone has the opportunity to live in a safe, healthy, affordable home. In the spirit of the Olympics, I present a few all-star teams who’ve earned a round of applause and one shining moment on the Firesteel podium. 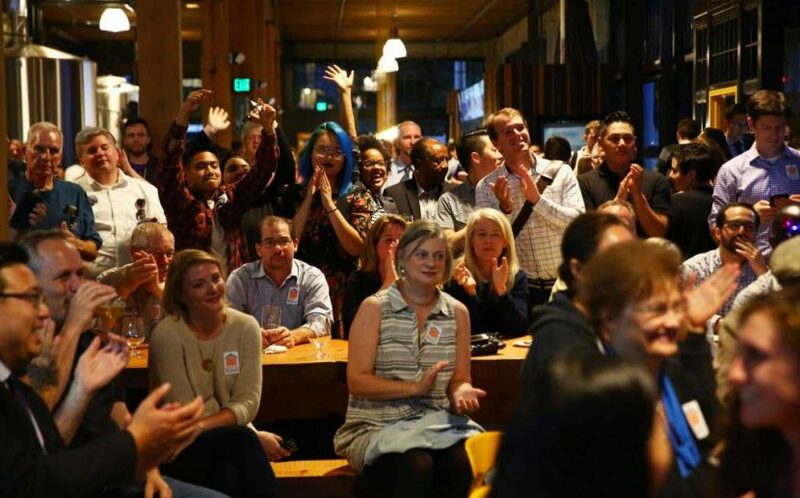 Advocates celebrated the Seattle Housing Levy’s landslide victory. Photo by Genna Martin for seattlepi.com. On Aug. 2, more than two-thirds of Seattle voters said yes to a $290 million levy. The bulk of the funds will build or preserve affordable rental homes for residents with low incomes. This includes residents with disabilities, such as YWCA Opportunity Place resident Sam, as well as seniors, families with children, and people who have experienced homelessness. Passing the levy is just one of piece of the big puzzle that we need to put together to solve our region’s housing and homelessness crisis, but it’s an important one. Way to go, Seattle voters! The Seattle City Council has passed groundbreaking tenant protections. Image from Seattle Municipal Archives. Also this month, the Seattle City Council unanimously passed an ordinance that will help protect renters from discrimination. The new ordinance will prevent landlords from passing over tenants who use assistance programs, such as disability benefits, to help pay the rent. It will also ban special deals for tenants who work at certain companies, and it will require landlords to offer their housing to the first applicant who meets rental criteria. The ordinance will help reduce the negative effects that bias has on housing opportunities, especially for people of color, in Seattle. Now we need a similar statewide law. Residents of Highland Village Apartments organized to save their affordable homes. Photo by Ryan Murray for Bellevue Reporter. Eighty-six Bellevue families living in homes that cost below market rate got terrible news earlier this summer: Their community, Highland Village Apartments, was slated to be razed and replaced by luxury townhouses. The residents, mostly people of color, have low incomes and could not afford other homes in Bellevue. The residents banded together with other advocates to preserve the apartments, and their efforts paid off. The developer and local governments recently reached an agreement for King County Housing Authority to buy the complex; rents will be kept at or near their current price. KING 5 captured some of the residents celebrating this huge win. It’s a motivating reminder that advocacy is a powerful team sport!